Challenging the idea that commercial entertainment is a corrupt teacher, this chapter argues that one of the roles of popular television is to contribute to the formation of ethics and cultural citizenship. Based on case studies of Glee, Empire, RuPaul’s Drag Race, The Prancing Elites Project, I Am Cait, Looking, Transparent and Sense8, it concludes that television’s engagement with queer Otherness can foster understanding and acceptance by presenting gender and sexual alterity at a “proper distance.” Despite some limitations, contemporary TV queers are likeable and relatable without being assimilated or heterosexualised. This chapter also argues that television educates by offering a range of perspectives and pedagogies. 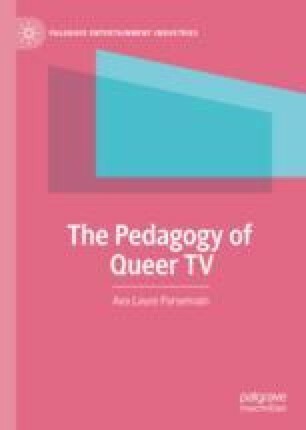 Television works through queerness by juxtaposing different ideological discourses and by assembling programmes, genres and distribution platforms.